Simplicity and minimalism (clear and concise presentation of the business; there’s no learning curve for navigation, scrolling guides users throughout the page; minimalism gives a modern look to the website). One page that keeps deploying content on scroll is all that a mobile user needs. So if you want to catch users en route with your message, a one-page website might be the best means. Navigational clues are simple to get noticed and trigger browsing content with interest. They are simple items like bounce arrows, scroll to top arrows, recurring delimitator shapes, etc. One-page websites are great for content division into logical chunks. It’s best practice to use separate sections for separate parts of a message. Users will get and process the information in a more effective way. Strictly in terms of design, one-page websites rule. You can go creative with the background onto which content is placed. And what’s more: instead of a unique background for the whole page, there’s the possibility to mould separate content chunks onto separate backgrounds (each of the backgrounds with their own catchy style). A prominent primary call-to-action makes a one-page website ready to trigger conversions. It’s a direct way to say what people are expecting you to say: that your business is the solution to their needs. Thus, a one-page website places communication further down the acquisition process, nearer the decision step. Clear and easy to use contact information comes together with the call-to-action that’s driven users to contact details. Turning the decision into action is a matter of jumping to the contact section, in the very page where users decided to collaborate with you. Little text is enough. One-page websites are fit for clear and concise messages, that get straight to users’ minds and needs. There’s no use bragging about this and that, you only focus on key points that users shouldn’t miss. 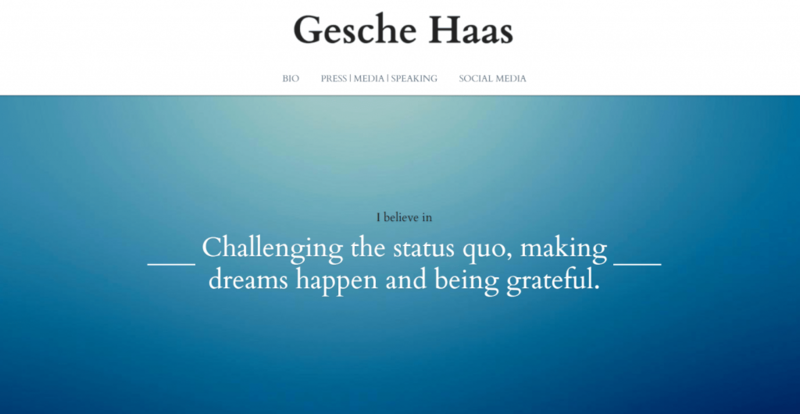 One-page websites are favourable to story-telling. You can have as many sections as needed for the story to unfold, keeping users’ attention focused. And there’s something more. Story telling gradually restricts the funnel towards conversion. Thus, one-page websites are great for landing pages. A one-page website tends to be a… long page. To make it easy for users to browse through the presentation, in-page links can be placed at key points in the content. They serve for orientation into the website text. One-page websites have a linear structure of presentation. This linearity guides the visitor from point A to point B, then to point C in the story; there’s no risk to get users lost in the page. This is given by the simple scrolling option. One-page websites are best for portfolios, landing pages, brochure websites, or any unconventional presentation that’s short and clear, and to the point. With additional features such as SEO-friendliness and translation-ready modules, one-page websites can go a long way in delivering your message to a wide audience. 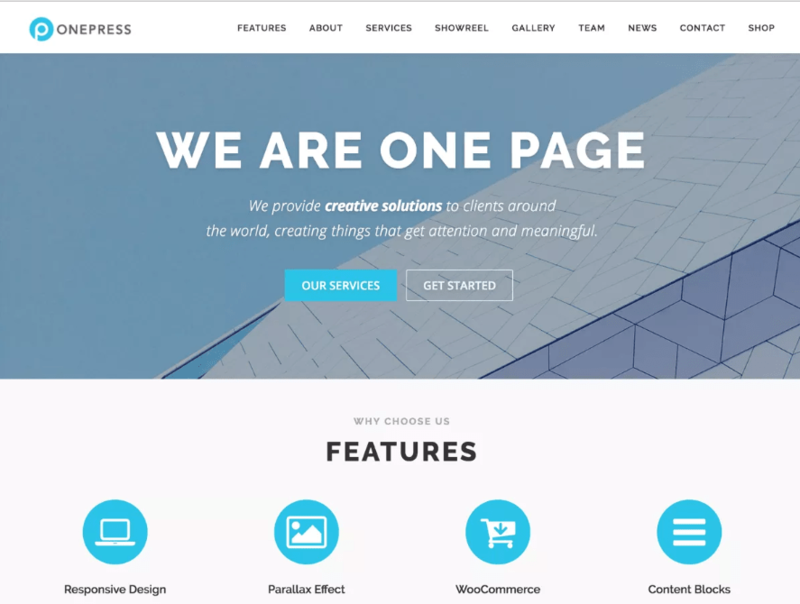 One Page Express, as its name says, helps you create a one-page website in no time. Plenty of features are available out of the box, so minute customizations won’t pose problems. It has a predesigned homepage and 30+ content sections you can select from. Thus, with the help of predesigned blocks, you can steadily approach the final design you want. Different header content types to choose what’s best for your brand identity. 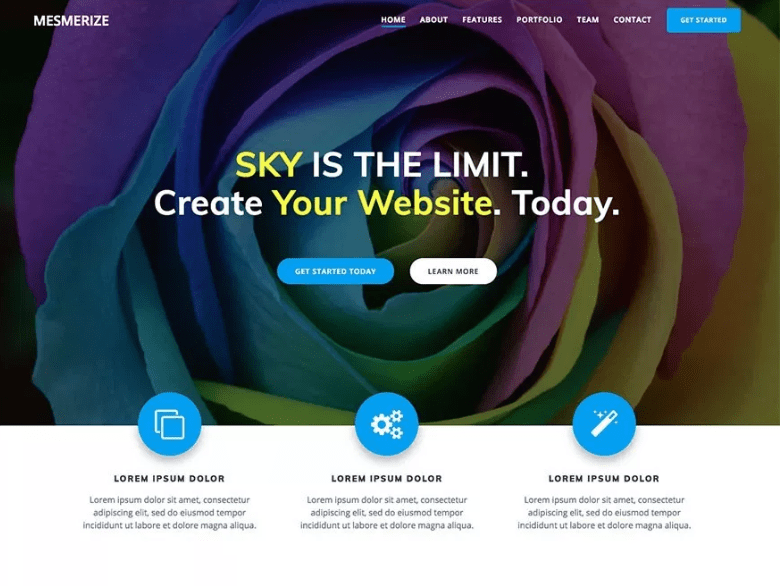 Mesmerize will let you create a one-page website that’ll mesmerize visitors. It has multiple options, which make it incredibly flexible and adaptable to any niche. The theme is optimized for mobile responsiveness, so your website displays well on mobile devices. OnePress comes packed with demo data, so users don’t start building their website from scratch. They have a starting point from which to customize items and shape their own online identity. Especially useful for non-technical persons who want to create a website in minutes, without too much fuss. You have full control over the layout of the page representing the website. Given the site will only contain one page, it’s important to create a special header for it. First impressions count most, so it’s essential to have a top-notch header. Sticky header, color of site title & tagline, colors for the menu links in different states, transparent header and transparent logo are some of the features that’ll help make a good first impression. Regarding navigation, OnePress has options for distinct customizations in case of in-section navigation (navigation items added to different sections in the page). The footer can include links to social profiles, as well as a newsletter form (integration with MailChimp). 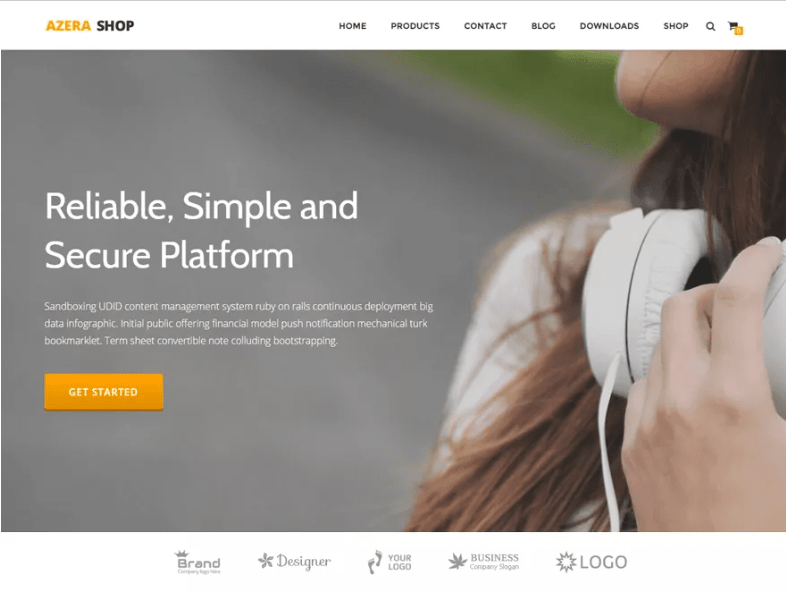 Shop Isle has the advantage of much flexibility, as it is integrated with WPML (for content translation), Contact Form 7, Photo Gallery Grid, WooCommerce and SEO plugins. As the name says, it is suitable for a one-page online store. It has all chances to maximize conversions, due to its features. The shop can be any niche. Flash recommends itself as a versatile theme, adaptable to any niche. It gives elegance to the website, and its features allow for some sophistication. With these particularities, your website has all chances to stand out. You already know the header is a crucial part of a one-page website. To make an excellent first impression, Flash comes with this feature: integration of media into the header. Besides visual effects, media instils dynamism to the presentation. You have options for header and top header, which will concur in emphasizing that your website’s worth users’ attention. 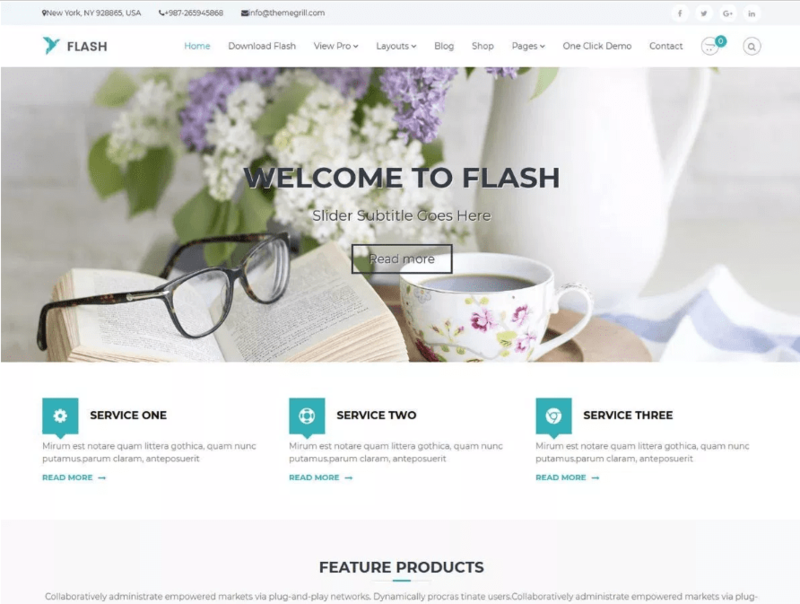 Flash has a bundle of options of its own, helping you customize the website and give it uniqueness. All the 9 options subcategories rely most on layout. So, you can play with different items placement and create the perfect layout perfectly matching your communication and design style. You can also expand the website to more than one page, in which case: you’ll have a different appearance for a simple page, a simple post and an archive page. 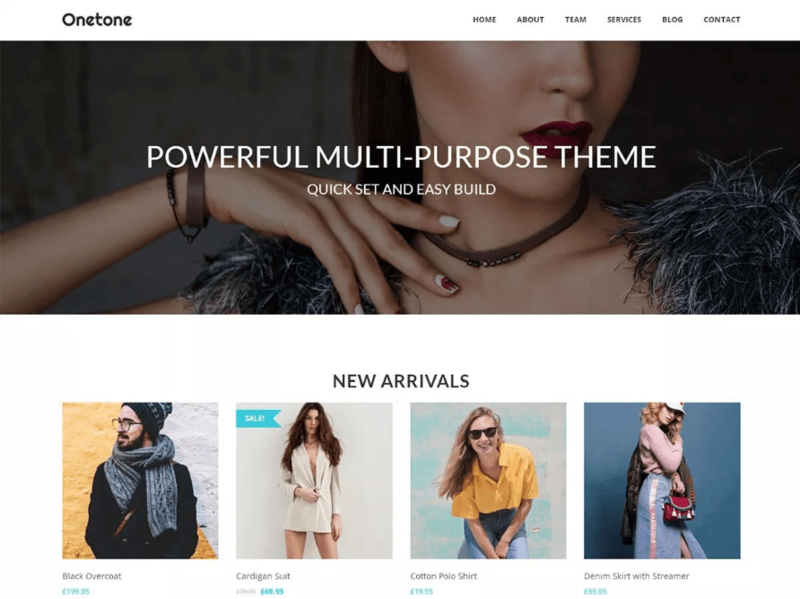 OneTone is a one-page theme perfectly suited for startups that want to quickly get noticed in the online world. It’s a multipurpose theme, that can sustain any kind of business, due to its functionalities. Also, OneTone is fully compatible with WooCommerce, so you can turn your website into an online store instantly. Adjustments for the sidebar: you can choose the way a sidebar is displayed, in case of single post, category pages, search page, 404 page, etc. Styling options, from colors to fonts, and background, are another asset for going unique with your website. 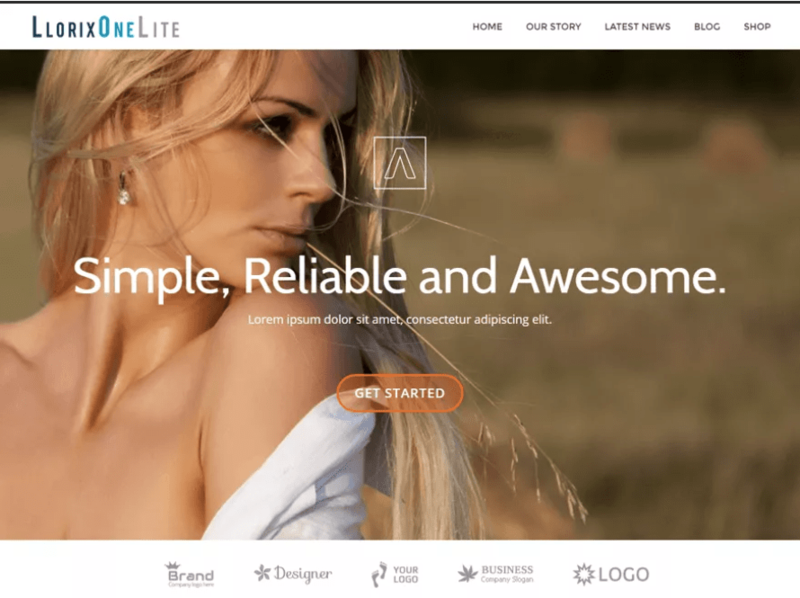 Evolve outshines many other free WordPress themes with its many, many features. It has a visual and intuitive menu in the Customizer, where you can adjust any option regarding the design and style of your website. Buttons receive special attention, due to multiple options that allow for minute customizations, depending on the design guidelines. 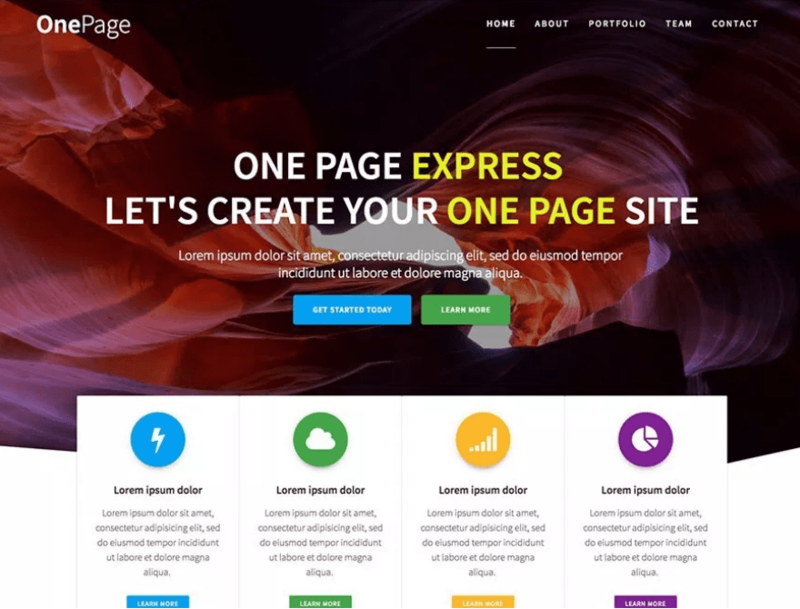 The theme has additional features like parallax slider, posts slider, etc. 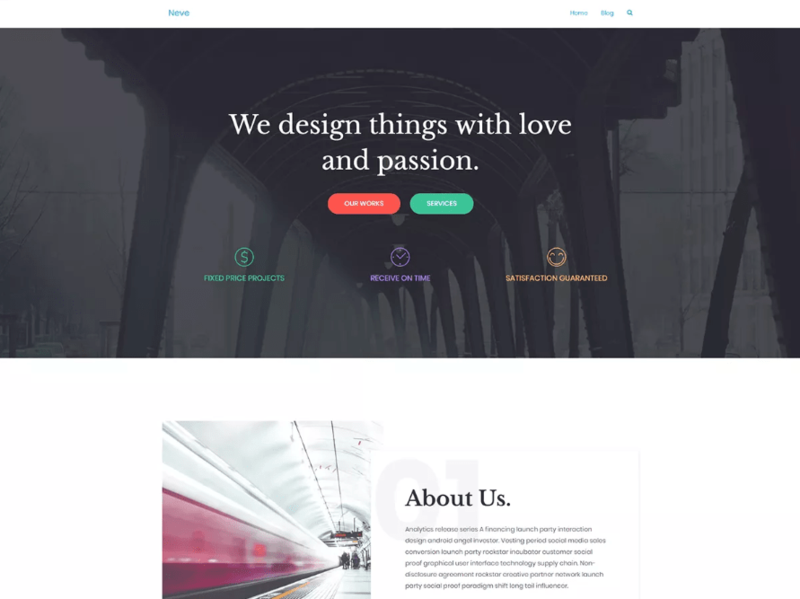 Neve is a one-page theme that might prove useful for any kind of business/blog/startup. It has a minimalist design, allowing for maximal flexibility in the meantime. It is well suited for startups, agencies, portfolios, blogs and not only that. 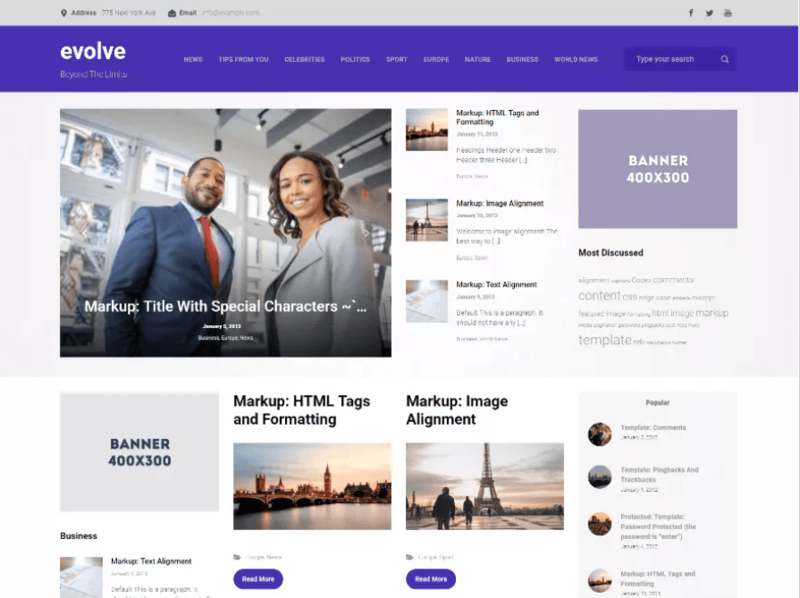 The theme focuses on layout options: you find different layouts you can play with, for Content/Sidebar, Blog/Archive, a single post or the footer. Typography can contribute to a unique look of the text onto the page, putting a focus on what’s most important and underlining key parts of the business message. For colors, you’ll find several options that will affect buttons, links, text and background. This can help designing in line with the branding requirements and creating the perfect one-page website. Llorix One Lite can be a good choice for simple websites, that surprise users through the power of minimalism and elegance. It ensures a modern look, so websites built with Llorix One are easily noticed and remembered. The theme requires installation of a plugin (Llorix One Companion), to take full advantage of the options the theme has. It allows you to enable parallax effect and give a plus of elegance to the already noteworthy website you’ve started creating. It focuses on visuals, so it might be well suited for a photography portfolio or other website type that needs visual force to express its uniqueness. 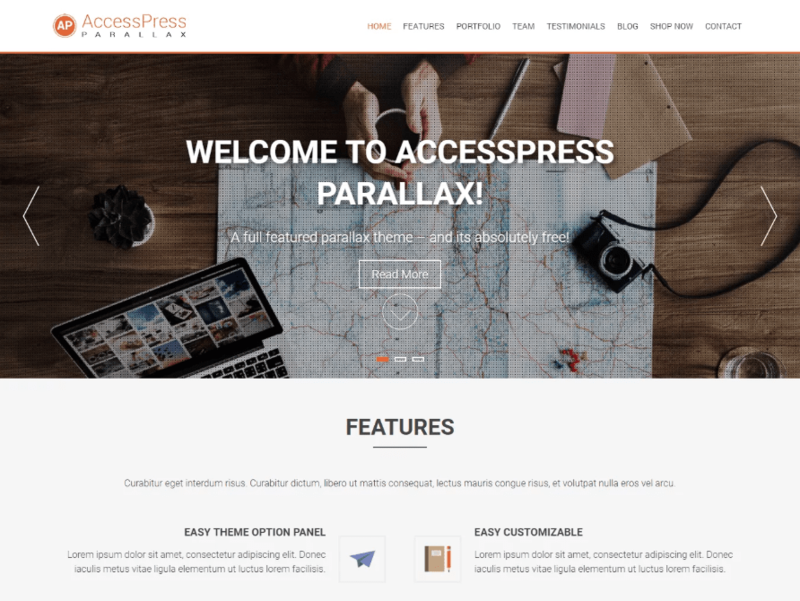 AccessPress Parallax has a little bit of everything a one-page theme needs to have: professional presentation, but also adaptable to blogs and other personal sites; with modern effects like parallax, that contribute to the best design, once enabled. Also, it’s responsive and it displays well on mobile devices (mobile and tablets). It also allows for Google Map integration, for easy geolocation. Once created, the site identity can be well supported with a beautiful header image you can upload from your device. 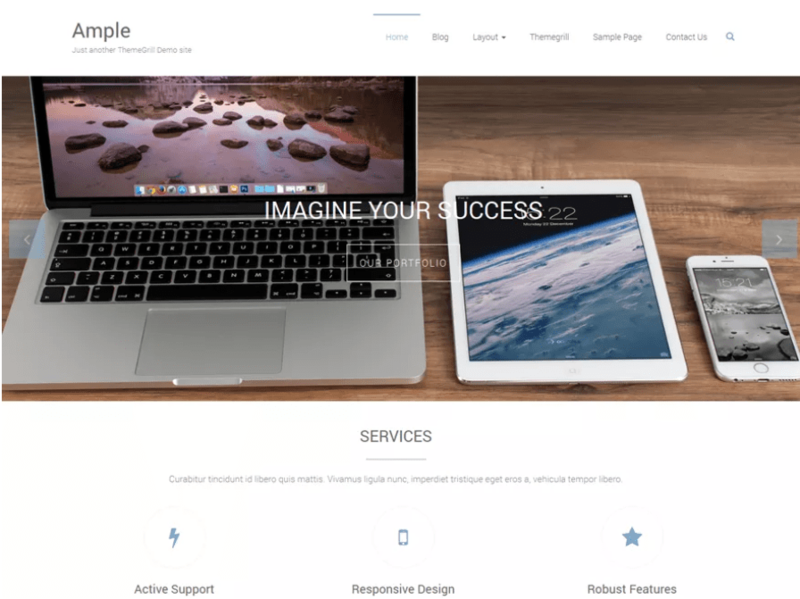 Ample is another one-page theme you can use for whatever niche you need. By using Ample for your website, you can give it the professional appearance it needs to convince users they’re landed on the right page. You also have the possibility to insert a slider into the page. 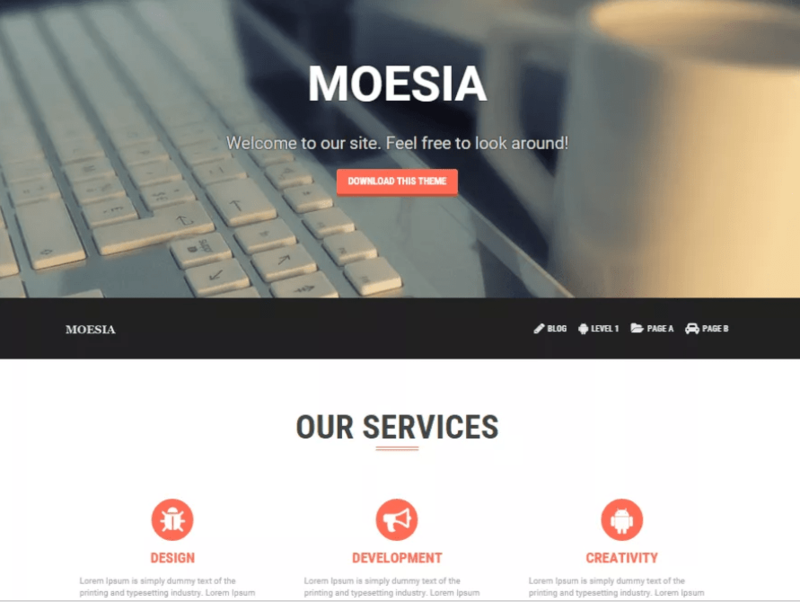 Moesia is a one-page theme you can successfully use to build a business website in no time, with few resources. More than 10 predefined blocks help you get inspired and take the design direction you want for your website. It best suits professional presentation, however hard it might seem to build it in a one-page website. 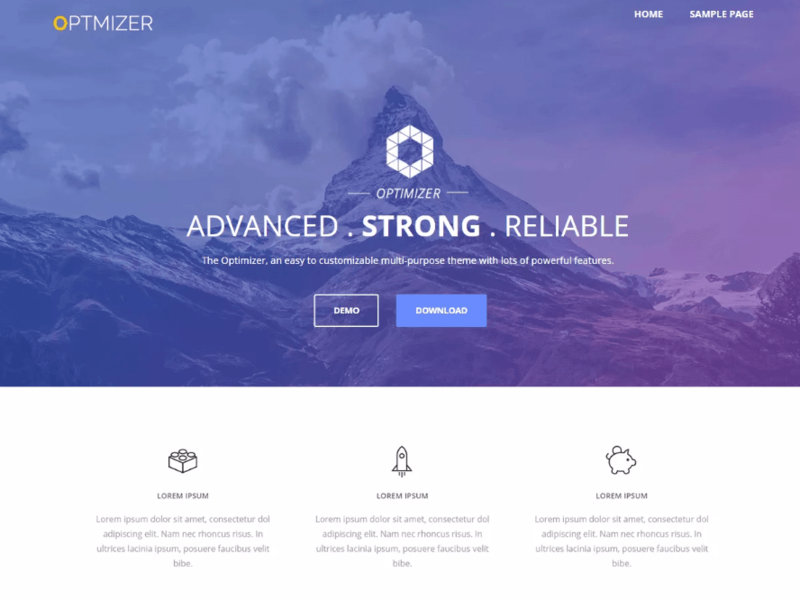 Optimizer is a one-page theme that can be used for any niche. It’s a special theme with multiple features that can turn a simple draft into a top-notch website. The Customizer has a nice interface with an intuitive menu on the left-hand. The features for each item can easily be adjusted to give the website page the appearance you want. Customizations start from basic options that serve as basis for good website creation: it’s essential to choose the suitable website layout, and Optimizer offers 2 variants: full-width and boxed layout. In terms of styling, the theme has options to choose colors for the background, content text; it has options for font of the text (normal text) and differentiate it from heading/menu/post titles text. After basic options are set, you can continue customizations for each important part of your one-page website: header, front-page, footer, menus and widgets. Optimizer also allows for creating an enhanced gallery of images and adjust the layout for display on mobile devices (which is highly important for mobile users experience). 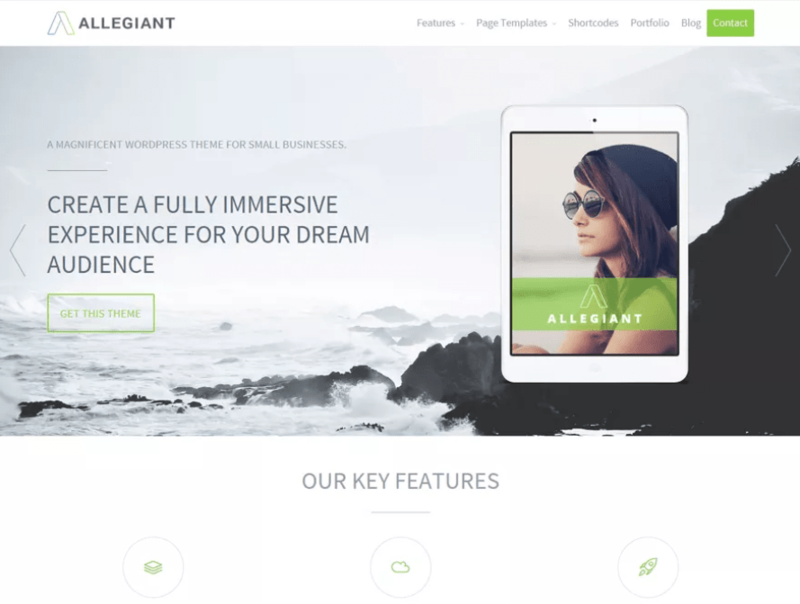 Allegiant is a theme that takes web design to the next level. It ensures your presentation will be professional, elegant, clean and convincing. It has all needed options to build a modern website, the simplest way. The companion plugin extends the theme functionalities, so you can benefit from a full range of customizations that’ll make your website stand out. You have the possibility to include these (or some of these) content sections into your website: features (of your products/services), portfolio (that shows the work you’ve done before), services, team members (where you’ll present your team), testimonials (that give credibility to the website), clients. All of these sections can be added to give a complete presentation of your business. The general theme options include customizations that make up the brand personality and communication style. The theme integrates with common plugins such as Contact Form 7, Woocommerce, Yoast SEO, WPML, etc. 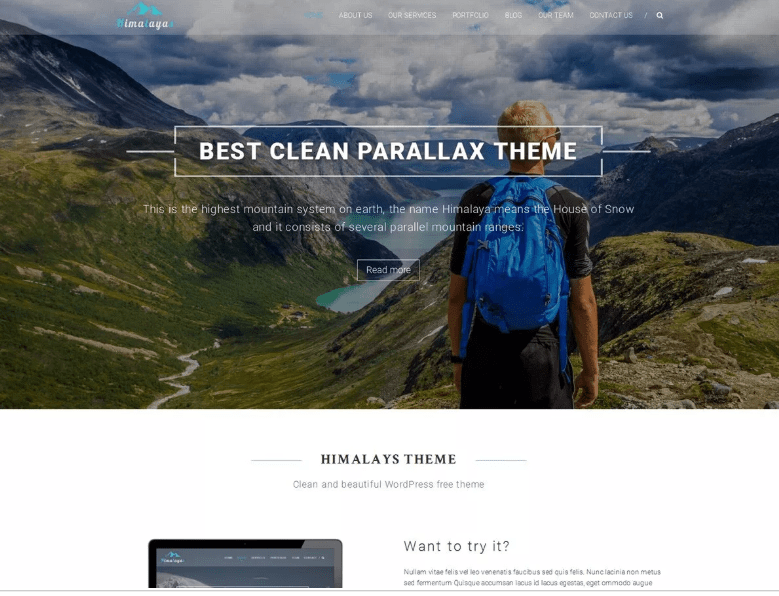 Himalayas is a modern theme you can successfully use to build your one-page website. It really helps giving a competitive edge to a website, and make it stand out from the crowd. It may serve as best expression of your search for perfection (either in business, or freelancing, hobbies, etc.). The options for the header put you in control of the header display as sticky/non-sticky, as transparent/non-transparent. Talon is a simple theme, that has the power to impress by its own simplicity. It’s suitable for any niche, and ensures your presentation is elegant, clean and concise. Starting with Talon, building a one-page website is easy and enjoyable. It has many features you can use to give uniqueness to your website. A dedicated section in the left-hand menu of the Customizer allows you to upload an image of your choice and set it as background of your page. As you only have one page to impress users, you need to design well every element in that page. The background is part of them. Colors are powerful in setting the tone of your message. Besides what you communicate, it’s important to decide how you communicate it. Colors are the means to transmit certain emotions to your readers. And Talon gives you 10+ customization options for colors you put into the site. Fonts and typography are also important to make your content stand out. Talon has special options for them, so you can match text display with overall design style. You can add a blog to your website. 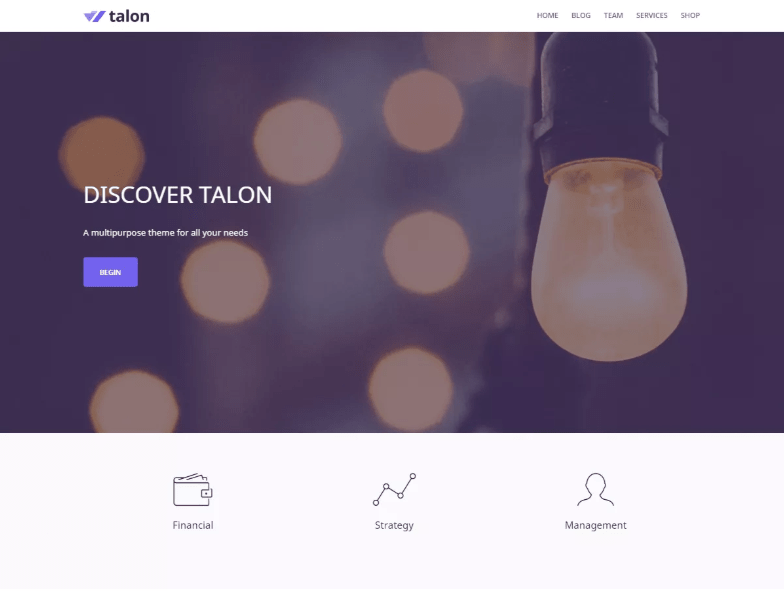 In case you choose to create one, Talon has features regarding the blog layout, display post excerpts, etc. As its name says, Azera Shop is a theme dedicated to online stores. At first glance, it might seem unusual to build an online store into a one-page website. However, as said above, a one-page website has the advantage of shortening the path to conversion. It keeps users engaged with the content of one single page and leads them closer to the decision step. It goes without saying, Azera Shop is fully integrated with WooCommerce, so you can set your shop easily. The theme is also compatible with Contact Form 7, and WPML (so you can replicate the site content to other linguistic versions), and SEO plugins. To fully benefit from the theme options, you have to install Orbit Fox, as it’s indicated in the Customizer. 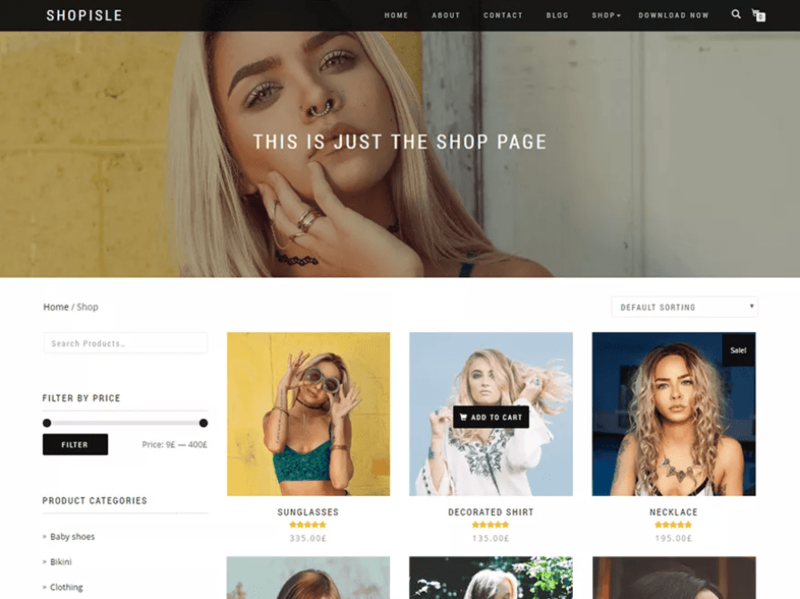 The theme works well for any niche, and ecommerce features are its strengths. 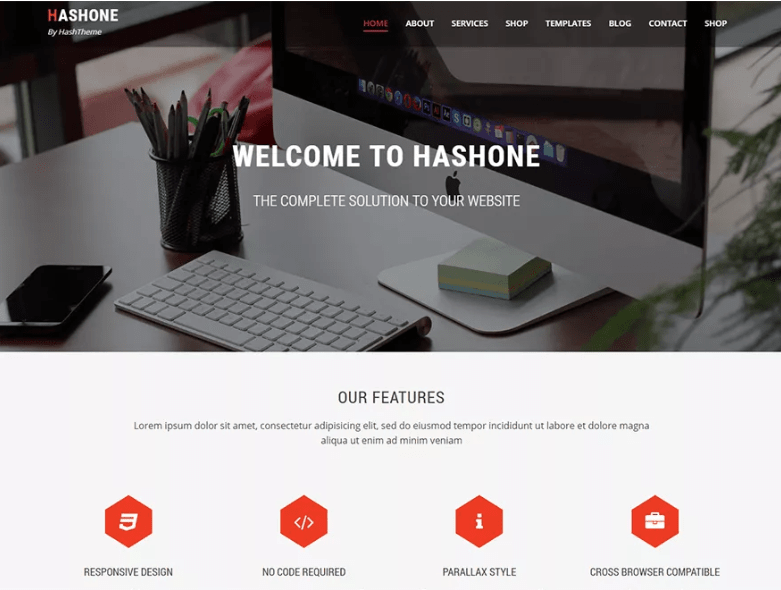 HashOne is a powerful theme you can use for any kind of niche. It is feature-rich, so you can customize your website to your liking. It has specific options for each section you can enable for the homepage (About, Featured, Portfolio, Service, Team, Counter, Clients, Testimonials, Contact). By default, these sections are included into the page of your website, and to eliminate some of them implies disabling display of those sections. HashOne offers options for creating your own color scheme. In addition, you have options for customizing the background of the page and thus putting content to the forefront in a more efficient way. 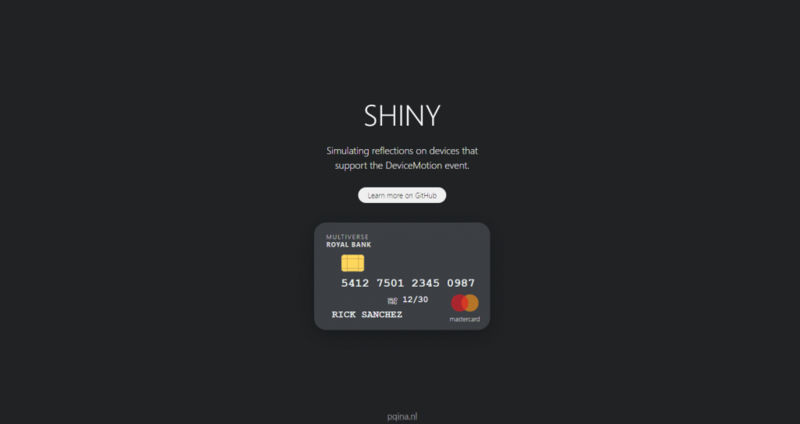 Options for defining the site identity couldn’t have missed from HashOne. You have to adjust settings for site title and tagline, as well as the header background. 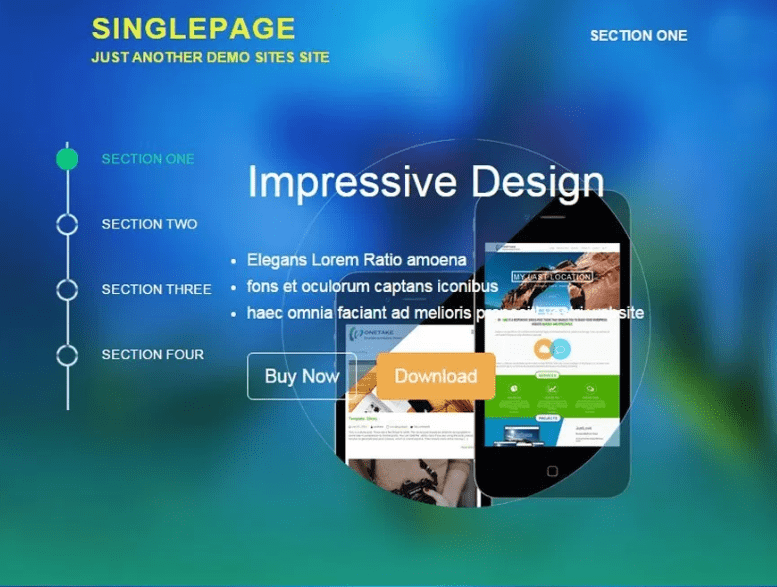 SinglePage is a one-page theme with the features of a powerful classical theme. Besides the standard options available, SinglePage comes packed with specific features that can make your website… simply gorgeous. 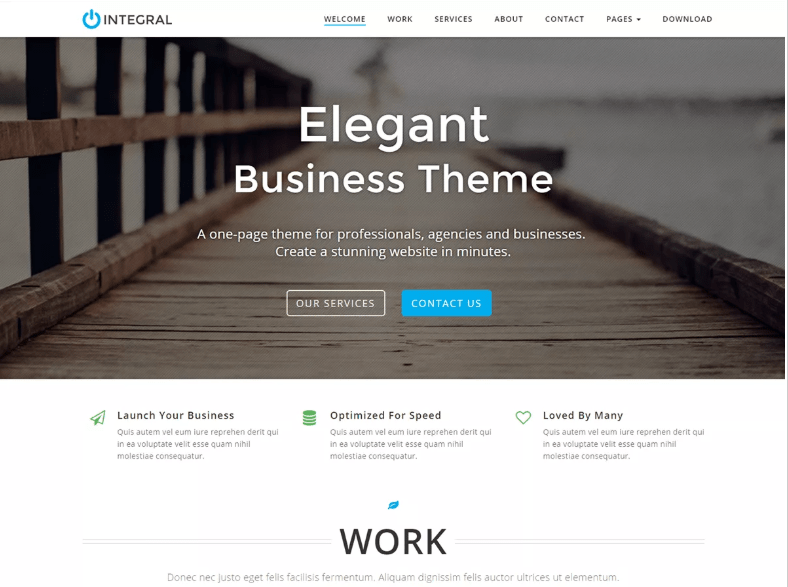 Integral fully deserves its name as an elegant business theme. It’s one-page, and well adaptable to any kind of niche. Integral has specific options for customizing the header. Header is one of the most important elements in a one-page website, so it needs special attention. With Integra, you can customize it accordingly. It is compatible with plugins such as Contact form 7, WooCommerce, etc. It observes minimalist principles of web design and uses them to create elegance and perfection for every website that’s built upon it. 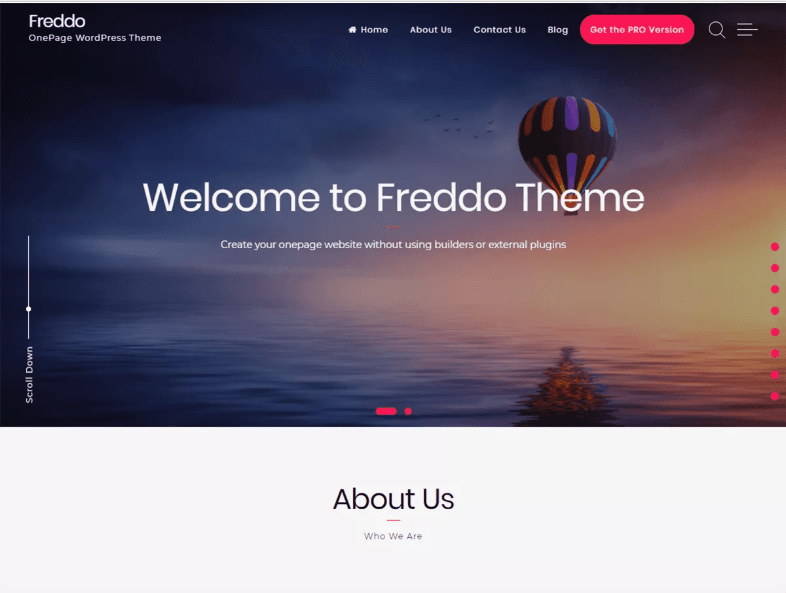 Freddo uses minimalism at the service of complex one-page websites. It’s elegant, it’s stylish, and you can use it for whatever niche you want. The options in the theme colors category help you create your own unique color scheme. Hence, you can transmit the exact message you have to communicate to your readers, in the exact way you want to transmit it. We hope you’ll quickly find the right theme for your new one-page website, and that our collection of free one-page WordPress themes helped you in your research. We’d love to hear which is the winner theme you’ve decided upon and what suggestions of other themes you have for us, to add to the collection.